“What should I pack?” It’s a normal question we all ask ourselves. Our passion is travel, so naturally, we have compiled a personal list of awesome travel accessories. We both just added these to our packs, but we already know we’re going to love them. They’re extremely versatile, pack up next to nothing, and offer protection. They are one those super simple products that you wish you’d thought of yourself. The Buff Headbands are more or less a tube of microfiber polyester fabric that can stretch and fold up to be worn in a wide range of ways. Check the current price now! In this day and age, it seems pretty hard to live without power. Between cameras, travel laptops, and cell phones something always needs to be charged. However, sometimes having access to a bunch of outlets isn’t possible or just makes things cluttered and disorganized. We love this power strip because of its size, the fact it can swivel, and it has two USB ports that help eliminate adapters for things like phones or our GoPro. We’re destroying our environment with plastic waste, but sometimes drinking tap water while traveling isn’t a viable option. So, in the past purchasing bottled water was the workaround for this, which is only adding to the waste we create. Now, we have a number of companies on the market who make water bottles geared for travelers and hikers to have safe drinking water on the go. 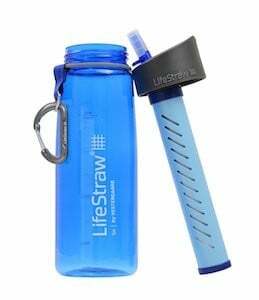 We choose Lifestraw for their philanthropic work, and the easy to use design. Check out the current price now! I spent some time scouring reviews and looking for a portable charger that gave me the most bang for my buck. I came across the Anker Astro, as did many other people. It has a serious amount of excellent reviews. What makes it special is the smart USB port that matches your phone or electronics ideal charging amperage, meaning your iPhone or android charges as fast as possible. A dead electronic only makes a good paper weight. Have we mentioned that we love our GoPro? Seriously, though we love it. It’s small, discreet, fun, and can go just about anywhere. It’s one of those things you quickly come to love and can’t imagine traveling without. We have a post here breaking down what GoPro we like, and the GoPro even has a list of its own awesome travel accessories. We don’t think anyone would disagree about needing less environmental degradation and skin cancer in the world. When you’re traveling you’re often spending more time outdoors and at peak sun times, which means greater exposure. Having a good sunblock is crucial to ensure your skin stays healthy. The fact that the majority of sunblocks on the market contain chemicals that you should be dubious about putting on your skin and damage the environment means you should probably spend the extra dollars on a decent natural sunblock. We love PEAK’s all natural sunblock. Don’t forget to get the neck and the back of the hands! If you’ve been following our blog or Instagram chances are you’ve seen Tasha sporting her favorite jacket. We also named this one of the best packable down jackets on the market after trying out a ton of other contenders. The Patagonia Nano Puff Jacket is lightweight, warm, and packs up into itself. Going with quality brands that stand behind their products and provide versatility is crucial when packing for a trip around the world. With a wide selection of colors and a great warranty, this jacket is a winner on our list of awesome travel accessories. This is one that’s great for those who spend their time outdoors. The Dry Sak is a self-sealing dry pack that allows you to keep valuables, electronics, and whatever else safely stored away. It offers protection for hiking in rainy mountains, rafting down a river, or just getting caught in a rainstorm at the wrong time. It only takes one time for this bag to be useful because that is all it takes for an iPhone to get ruined. 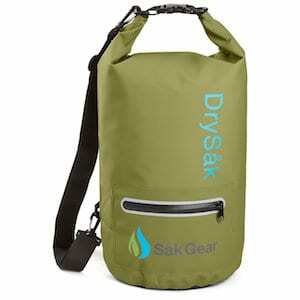 We love the Dry Sak because of the external pocket, carrying strap, and sturdy design. Music is pretty much a facet of life. Being able to take your music on the go and listen to it on the beach is great. The Cambridge SoundWorks OontZ Angle 3 is weatherproof and comes with terrific reviews. It’s plenty small enough to throw in your day bag and head out for a day on the beach. To top it all off the tiny speaker sounds great and will be sure to keep you entertained. With a price tag of only $27.99, it was an easy decision to add it our list of awesome travel accessories. Keeping a journal of your travels is timeless. It helps one digest the information they receive each day, and has proven mental health benefits. Moleskin’s line of journals is classic, well made, and stylish. We both carry a moleskin journal and love them for long plane rides, sitting in the back of the bus, or laying on the beach. If there is one travel accessory to carry out of the whole bunch it’s a good journal.